The Father Frank Sheehan Award for Service to Community is awarded to those who have made sustained contributions to the betterment of the community. It embodies the School’s vision of boys making a positive difference in their world and honours all who choose to help others, particularly the disadvantaged and vulnerable. Father Frank Sheehan has been the Christ Church Grammar School Chaplain since 1985 and is the School’s longest serving Chaplain. His commitment to the boys and the broader community has been outstanding. The award recognises the work of this remarkable man who has inspired many through his leadership and service to the community. Responsible for establishing the School’s Centre for Ethics in 1996, with Father Frank’s leadership the Centre has welcomed speakers from a wide variety of backgrounds: philosophers, theologians, members of parliament, novelists, poets, educators, leaders who model an ethical way of life (some famous, others not) those who work actively to change the world, those who place more emphasis on reflection. 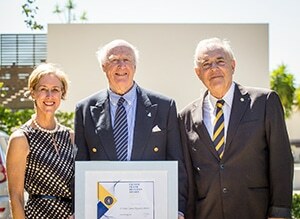 The work of the Centre for Ethics, and the widespread respect for Father Sheehan, has enhanced the School’s reputation among parents, old boys and the general community. This Award is one of the highest honours the School can bestow upon a member of the Christ Church Grammar School community. All old boys, staff members (current and past), parents and grandparents of Christ Church Grammar School boys (current and past) are eligible for nomination. Entries close 6 December 2019. Nomination guidelines are available here. For all other enquiries please contact a member of the Philanthropy team on +61 8 9442 1535 or email giving@ccgs.wa.edu.au. It was our great honour to bestow old boy Dr Grant Fergusson Stewart (‘56) with the inaugural Father Frank Sheehan Award for Service to Community on Thursday 15 February 2018 in recognition of his ongoing volunteer work in the area of medical surgery, where he has provided surgical care for the underprivileged throughout remote areas of Asia.